As more companies build their businesses around software, network and data-center pros will also be looking toward software to optimize their skills. While software may not be the first thing to come to mind when dealing with data centers, IT industry watchers say experienced network and infrastructure professionals would be wise to up their code game. Popular technology trends such as public, private and hybrid cloud, Internet of Things, artificial intelligence and machine learning will prompt network and data center pros to invest their training time and dollars in better understanding the software side of the IT house. So how exactly will software start to play a bigger role in network pros’ daily work? For some, roles around DevOps (development and IT operations) could emerge, and for others, understanding how to prioritize network traffic across private and public clouds will become critical to IT’s success. And others will need to learn enough about coding to automate tasks that have been traditionally performed manually by systems administrators. For too long, the hardware and software roles in IT remained separate. Now the lines are blurring, and for those building and managing infrastructure, software will ease the manual work involved with maintaining exponentially more systems—virtual and physical. The premise of incorporating development know-how with operations skills isn’t new and often falls under the umbrella of DevOps, a process methodology that encompasses software development and IT operations teams working more closely together from design to production. The benefits are said to include software that works better and as expected on the production network because the operations team shared insights with developers. “Hiring managers are looking for more lateral thinking, a skilled technologist that can work well with different teams. 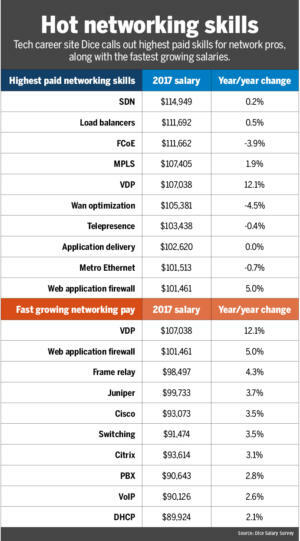 Network professionals will have to draw from a larger palette of resources such as DevOps, cloud, security, IoT, AI and more,” CompTIA’s Stanger says. Data center pros that take advantage of software to scale and optimize their environments will see success in the coming months. And the role of simply monitoring servers in a data center might not exist because it will evolve into another role that incorporates software coding skills to automate systems management.